Our first ever Family Photo Night fundraiser was a huge success. The PAC raised $640! Thank you to all the families that participated. We really appreciate your enthusiasm. Our apologies to those families that didn’t get a chance to participate in the photo night. We are looking into booking three nights for next year. 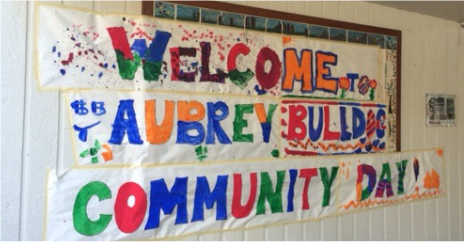 Welcome to L'Ecole Aubrey Elementary School! We look forward to meeting your family and wish you a warm welcome to our school community. We are here to support our kids by actively engaging in year round activities and fundraising to enhance their classroom learning. Thank you to all the teachers, the administration and the parents who helped out in our first ever Community Day! Everyone enjoyed a fun-filled day with the children getting a chance to see inside a police vehicle, make their own minion, try irish dancing or poi throwing and watch an exciting magic show! PAC Voluntary Donation Drive - DUE OCTOBER 30, 2015! ​The Aubrey PAC is holding its Annual Voluntary Donation Drive which helps to fund many “extras” that are beneficial to the students at Aubrey. Click here to learn more about this initiative. Only online donations of $20 dollars or more are eligible for a tax receipt from the Burnaby School Board. Donate online through the Cash Online program. ​For instructions on how to make an online donation through the Cash Online program, click here. When in the “Zone”, you must REMAIN IN YOUR VEHICLE. Go to our Traffic & Safety Committee page for more detailed traffic & safety information at Aubrey School. The Parent Advisory Council (PAC) is a volunteer group of parents of the children attending L'Ecole Aubrey School. All parents and guardians with children enrolled at the school are automatically PAC members.